« Were Jack Dempsey’s Gloves “Loaded” When He First Won the Heavyweight Championship? BASKETBALL LEGEND: A missed free throw by an Austin Peay player in 1987 changed the direction of the New York Knicks for the next fifteen years. Clearly, the history of basketball is filled with seemingly minor decisions that had ripples that affected players and coaches throughout the league. One of the most famous would be “What if the Portland Trailblazers had drafted Michael Jordan with the #2 pick in the 1984 NBA Draft?” But just as clearly, there are smaller examples that might not have the same glorification of the Blazers passing on Jordan or the Detroit Pistons passing on Carmelo Anthony, Chris Bosh and Dwayne Wade in the 2004 NBA Draft, but they still change a team’s destiny. This brings us to Bob Thomas, and how his missed free throw in 1987 affected the Knicks franchise for the next fifteen years or so. “That kid,” of course, was Bob Thomas. Rick Pitino began his coaching career in 1974 with a few college assistant jobs (including working under Jim Boeheim as Boeheim’s first assistant coach at Syracuse University). In 1978, he got his first head coaching gig at Boston University, where he would remain until 1983, when he went to work for the New York Knicks as an assistant coach under Hubie Brown. 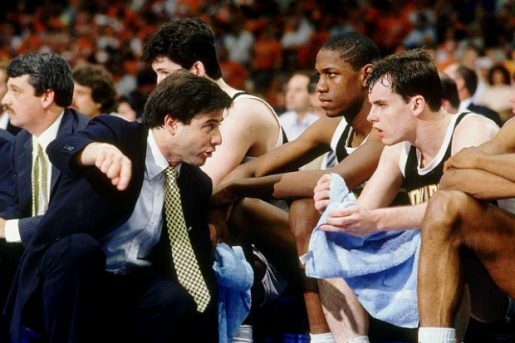 In 1985, Pitino left the Knicks to take the head coaching job at Providence College. Within a year, Pitino had the relatively small program (although one with a lot of good history) back on the college basketball map. In 1987, the team made the NCAA tournament for the first time since 1978. Seeded sixth in the Southeast Region, Providence defeated the University of Alabama at Birmingham in the first round. In the second round, they were matched up against Austin Peay University, a fourteen seed who had upset the third-seeded Illinois in the opening round. With a little less than six minutes to play, Providence trailed Austin Peay by ten points, 75-65. However, a furious comeback, fueled by star point guard Billy Donovan, saw Providence taking a one-point lead, 80-79, with 2:29 left to play. With just under a minute to go, though, Austin Peay’s Darryl Bedford completed a three-point play to give Austin Peay an 82-80 lead. After a Providence miss on the other end, Austin Peay Senior big man Bob Thomas got the rebound. He was promptly fouled and went to shoot a one and one (where the player has to make the first free throw to get to attempt the second). Thomas was a mediocre free throw shooter and, sure enough, he missed the free throw and Providence got the ball back. With 16 seconds left, Donovan came through with a game-tying bucket. Austin Peay ran the shot clock down for last second shot, and an Austin Peay player’s long jumper missed with just a few seconds left. However, Thomas was there for the rebound and he was fouled. Once again a one and one, Thomas needed to just make one to seal the victory for Austin Peay. Instead, he missed the free throw, sending the game to overtime where Providence pulled out the victory. Providence would go on to make it all the way to the Final Four. Pitino was now a household name in the world of basketball coaching, and he signed on with the Knicks as the new head coach in June of 1987 (Pitino actually first signed a new five-year deal with Providence, but the deal had an escape clause). Brown’s complaint was almost certainly accurate. If Thomas makes the free throw and Providence lost in the second round, it seems unlikely that Pitino would have received the Knicks job. Meanwhile, Brown (then coach of Kansas University) might very well have been chosen to be the coach. Can you imagine Larry Brown coaching a young Patrick Ewing? Amusingly, Brown’s story of how Final Four success led to an NBA head coaching gig was prescient as Brown himself got a job as the San Antonio Spurs head coach after leading Kansas to the 1988 NCAA Tournament championship! In any event, the impact by Thomas was not just a matter of Rick Pitino getting the job in 1987 instead of Larry Brown, but also, the success of Providence led to Pitino bringing one of his assistant coaches, Stu Jackson, to the NBA with him as an assistant. When Pitino left the Knicks after two seasons to take over as head coach at Kentucky, Jackson was given the opportunity to go with him. Instead, he decided to stay to work as an assistant under whoever was given the job after Pitino. That ended up being Jackson himself! Jackson’s tenure as head coach was brief but significant, mostly because of an assistant coach he hired. While at Providence, Pitino had a graduate student assistant named Jeff Van Gundy, who had stayed on to be a full-time assistant coach when Pitino left, and in 1988-89 became an assistant at Rutgers. Jackson remembered Van Gundy and hired him for his Knicks assistant staff. I think you all know how that worked out for Van Gundy (after three more head coaches following Jackson kept him aboard). Heck, if you want to stretch the idea beyond all sense, you could even argue that had it not been for Providence’s Final Four run, Billy Donovan (who later worked for his Providence coach Pitino as an assistant at Kentucky before becoming head coach of the University of Florida) would never get the chance to be the head coach of University of Florida and then the head coach of the Oklahoma City Thunder. But that may be taking it a bridge too far, as it were. Especially since we already have a pretty clear line of impact caused by that missed Bob Thomas free throw from twenty-three years ago. Thanks to reader Jacob for the suggestion I feature Thomas’ free throw miss in this column. And thanks Mike Lupica, William Goldman and especially Larry Brown for the quote! This entry was posted on Friday, October 14th, 2016 at 3:56 pm	and is filed under Basketball Urban Legends. You can follow any responses to this entry through the RSS 2.0 feed. You can leave a response, or trackback from your own site.